Valentines Day is almost here! I’ve been buying myself candy (and eating it all) for weeks in preparation for the big day. 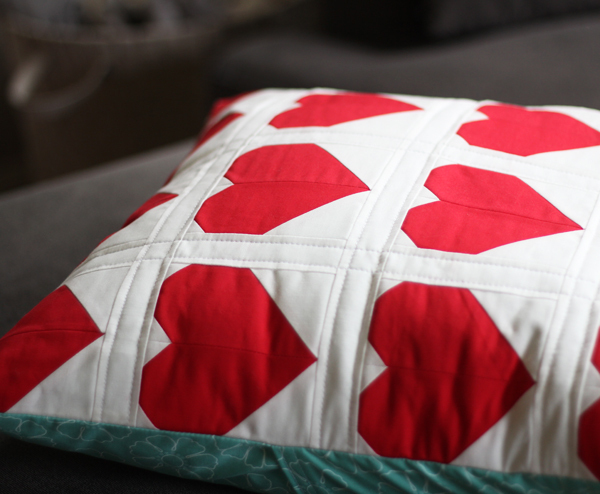 ;) Really I just used Valentines Day as a good excuse to make a red and white heart pillow for my couch that I will probably leave out all year long. Nettie made a black and white version last year that I’ve had on my mind ever since…and you know how I love a pop of red. This fits a 20″ Ikea pillow form perfectly. 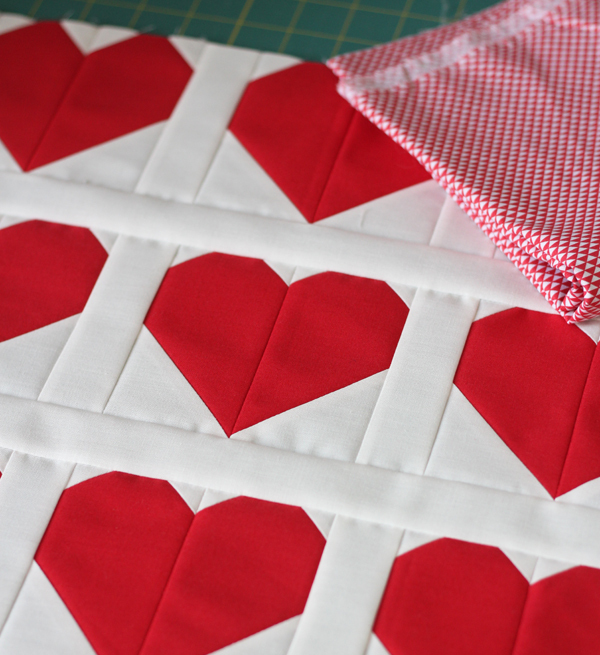 I made 16 of the 4″ finished heart blocks (from this tutorial), and put 1 1/2″ x 4 1/2″ strips in between each of the hearts to make the 4 rows, then 1 1/2″ x 19 1/2″ horizontal sashing strips in between the rows. That makes the pillow top 19″ after sewing the back on with a 1/4″ seam allowance. If you have a larger pillow form or a really firm 20″ form, you could add a white border around the whole thing before sewing the back on, but I like my pillows full so this worked perfect. 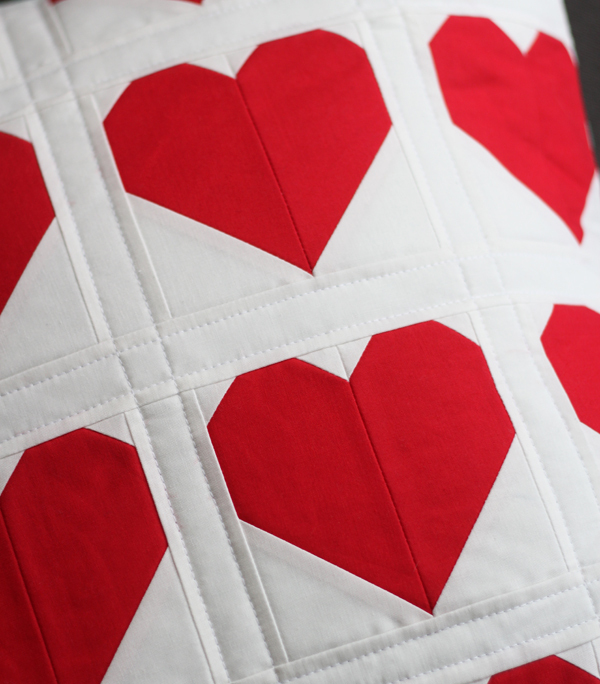 I kept the quilting minimal with simple lines in the sashing 1/4″ away from the seams. This pillow was even husband approved…and for a man who hates Valentines Day that’s sayin’ something! 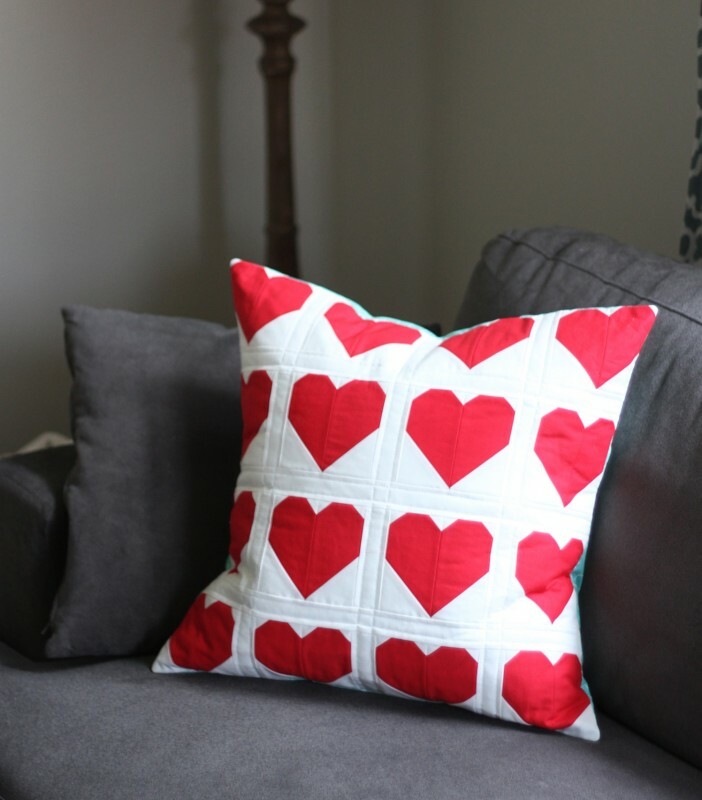 A beautiful Valentine’s Day pillow; love the hearts! Love the teal popping out from the back. :) And those hearts!! I just made a 10″ inch block from your tutorial for our #sewsweetbee February queen bee. Thank you so much for the free pattern. I’ve purchased two others of yours, and it is so kind to bless us with a freebie. Perfect for Valentines Day – or longer! Love this! I love it!! It’s so pretty with the teal! Thanks for sharing! Love, love, this pillow!!! Am away from my sewing machine for a week bit can’t wait to get home to make it! Gorgeous finish — so crisp and clean looking. I’m not for frou frou Valentine’s stuff (like your husband, I guess), so this is right up my alley. Red and white really pops and looks terrific Allison! Looks even better stuffed full like that too.